BeachTravels is very proud to present the best player in Sweden Stefan Gunnarsson, also known for “The Best Beard on the Beach”, as one of BeachTravels’ coaches in Clearwater Beach! Played 84 World Tour/European Tour events. Hey there Stefan Gunnarsson! Congratz to a successful season, with participation in both the World and European Championships! I know that you are now looking forward to go to Clearwater Beach on October 13-27th as one of the instructors in the BeachTravels crew, what are you most excited about? It’s going to be great to go to such an amazing place that Clearwater seems to be and train people who are striving to be better beach volley players. From what I’ve seen in pictures the beach seems to be extraordinary, so it’s going to be a cool experience! Your block and attack has been a huge success on the World Tour this season, what’s your secret? It’s just like most things in sports, practice practice and more practice. And of course, a good technique is very important. What is you greatest beach volley memory? I guess it has to be the week in Quebec when we came in fifth on World Tour. We played very well and lost a close game against Rosenthal/Gibb, that sent the winners to the semifinal. All and all you have played on the World Tour for ten seasons and with that travelled a great deal. What three things do you think should always be in your suitcase? Passport, a beard trimmer and Resorb is a must! Read more about BeachTravels training camp in Clearwater Beach here. 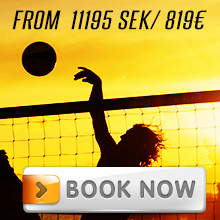 We have a 1000 SEK discount now until September 15th, use the booking code “Clearwater”!